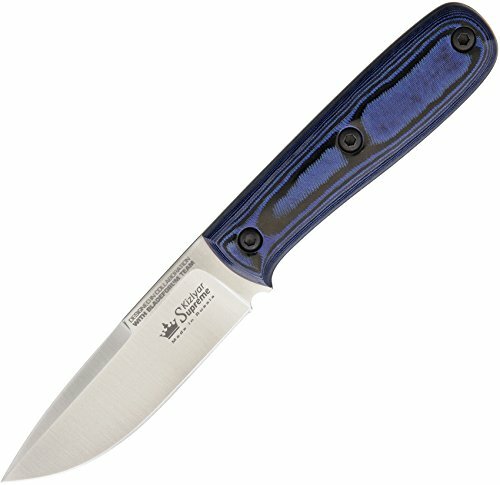 Colada - premium US Steel (CPM S35VN) in a no-nonsense package - Colada is a compact knife with a utilitarian blade shape utilizing the premium US made stainless steel CPM S35VN. Although it is small, its performance remains high. It is versatile in function and beautiful in style. The ~4" long blade is a drop point profile with a large swedge, a basic design, centuries old but timeless. It is for those who require a great, small scale all rounder with the capability to prepare food, kindling for a fire and process game up to a medium size. This is a full tang knife, with handle scales crafted from tough Blue/Black Layered Micarta. While guard less, this knife remains safe to use with the addition of a small recess just behind the blades edge. Colada, meaning cleansed in Spanish is an apt description for this model, with simple clean lines and no un-necessary features. The genuine leather sheath features a dual position belt loop for high or low carry options, depending on your preference. This knife is simple yet elegant, functional yet beautiful. It is rare to have all these characteristics within one product but we believe we have achieved it. Overall: 8 3/8" Blade Length: 4" Handle Length: 4 1/2" Weight: 6oz Blade Steel: CPM S35VN.